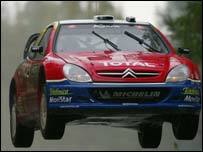 Rally supremo David Richards has vowed to do everything he can to find Colin McRae a drive for next year. McRae fears he will not have a seat and is facing an uncertain future after being axed by Citroen following rule changes which restrict teams' choice of third driver in 2004. But Richards, the commercial rights holder of the World Rally Championship, does not want rallying to lose one of its more charismatic figures. "I want Colin in the championship and I am doing everything I can to secure him a drive," said Richards, who was the 35-year-old's boss when he became the first Briton to win the world title in 1995. "My objective is to make sure he is in the championship because he is one of the icons of the sport and we need to keep him in there. "Colin hasn't got a drive at this minute in time but I am working with his father (Jimmy) to see if we can find a solution. I'd say his chances of getting a drive were 50-50. "We are looking at a whole raft of ideas and I don't want to prejudge what will be the outcome."